Hundreds of Palestinian police officers are scheduled to assume positions throughout the streets of Nablus on Friday morning. Officials within the Palestinian Authority confirmed the move and said it came as part of the first steps towards transferring security responsibility of the city to Palestinian hands. The process, they said, would begin within the next few days. But officially however, the deployment of Palestinian security forces comes at a time when Israel and the PA are still embroiled over the Palestinian's ability to maintain control over Nablus. Defense Minister Ehud Barak even discussed the matter with US Secretary of State Condoleezza Rice during the latter's recent visit to the region and reported that the Palestinians were finding it difficult to meet their own stated objective – deploying 500 security officers to the city. The Palestinians said in response that Israel was delaying the arrival of security forces to Nablus and that on Tuesday even turned back a group of officers trying to enter the city from the Hawara checkpoint. A Palestinian source said that Israel's attempts to deny the security forces entrance are a result of its desire to fail PA security efforts and continue to present the Palestinians as incompetent. Meanwhile the IDF confirmed the deployment of some 300 Palestinian security officers to Nablus, though officials maintained their purpose was to enforce law and order in the streets during the daytime and not as part of any transfer of security responsibility. The army said the move follows an agreement made between Defense Minister Ehud Barak and Palestinian Prime Minister Salam Fayyad. Meanwhile US Security Coordinator, General Keith Dayton, visited Nablus last week to inspect the PA's readiness to assume responsibility. On the day of his visit Dayton said the handover of Nablus marks the beginning of the establishment of a Palestinian state. "He led us to believe that the Palestinian state will be established from Nablus," the source added. 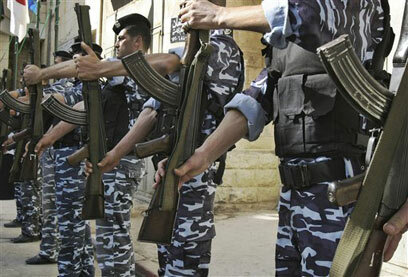 See all talkbacks "Palestinian security forces spread out through Nablus"